I am embarrassed to say that I have never reflected on the absence of sketch comedy written by and for females. Never struck me. Many sketch comedy troupes have been sexually integrated. But where is the female equivalent of, say, Monty Python? The producers of PianoFight love a good scandal and do not allow a taste for the (deceptively) low brow to get in the way of their social conscience and their commitment to new work. Hence, they bring us ForePlays — PianoFight’s female driven sketch comedy troupe. These performers have enjoyed ongoing success in the local comedy scene with regular Monday night shows. Currently, they have moved to Friday nights as part of PianoFight’s Triple Threat. If you haven’t seen them before, you should take the opportunity. This American Lie includes eleven sketches, developed in ForePlays’ writing workshops. The quality varies, but the abundant laughs are more than enough to justify the cost of a ticket. 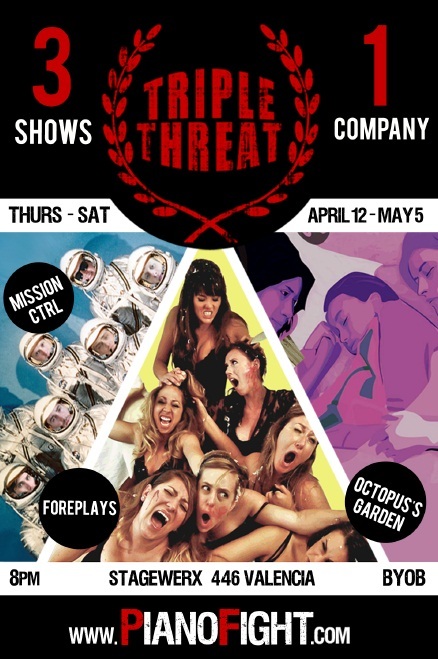 PianoFight's "Triple Threat" includes performances by comedy troupes MISSION CTRL and FOREPLAY as well as an original drama, "Octopus's Garden" by Scott Herman. My favorite sketches included “Pass The Salt”, a very funny reflection on the tradition of multigenerational family dinners, with a hell of a beat to boot. Also very funny was “Certified” in which members of various ethnic groups must achieve certification for their ethnic identity before they are allowed to tell ethnic jokes which would otherwise be offensive. This is, of course, an excuse to let loose with lots of politically incorrect material at which we get permission to laugh. It’s a lot of fun. At each Friday’s performance, ForePlays will include additional guest comedians and musicians. On Friday, the 13th, I had the good luck to see excellent songwriter Debbie Neigher as the musical act and the very, very funny Caitlin Gill as guest comedian. ForePlays’ This American Lie continues on Friday nights as part of PianoFight’s Triple Threat. For further information, click here. Posted in Reviews.Tagged ForePlays, Pianofight, This American Lie, Triple Threat.